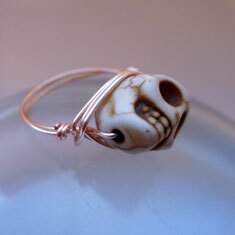 Wire wrapped bead rings, shiny, pretty, little jewels, silver, yellow gold, and rose gold. 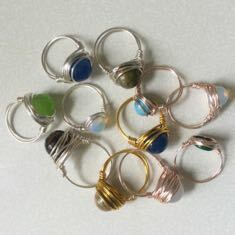 Ruth Beattie wraps each ring by hand, so no two are the same. Wear alone or stacked. Ruth Beattie Jewelry–inspired by nature and made with love. Each beautiful piece of Ruth Beattie jewelry is made by hand with the highest quality semiprecious stones, silver and gold. Our unique collection of handmade necklaces, bracelets and earrings complement any fashion style. Many of the pieces are one of a kind and made with beach glass, antique beads and findings, or found objects. 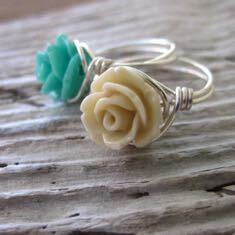 Special jewelry orders are available upon request.